Give your child a headstart with the DPA! If your child is taking his ‘O’ Levels exams this year, you must be wondering about the academic options for your child after that. If you child is considering a polytechnic education, coming up in June is the Direct Polytechnic Admission (DPA) exercise. DPA allows ‘O’ level students who have an interest in and aptitude for polytechnic education to apply and secure a place in a polytechnic before sitting for their ‘O’ levels. What are the benefits of DPA? 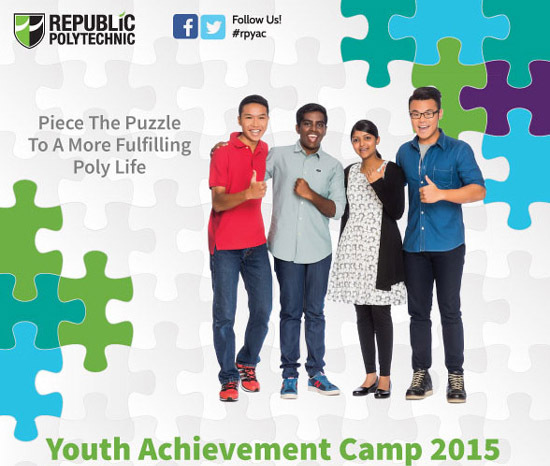 Republic Polytechnic (RP) is organising a full day Youth Achievement Camp (YAC) on 24 June 2015 to help your child ace the DPA and the ‘O’ Levels. From workshops with tips on how to submit a good application and ace the DPA interview, to motivational and time management talks by Adam Khoo Learning Co., we believe your child will enjoy and benefit from the programme! What’s more, parents are invited to join in the evening for a talk (also by trainers from Adam Khoo Learning Co.) on how to unlock your child’s potential by building their self-esteem and an introduction to polytechnic education and courses offered by RP. The programme is free so come join us! Register for the full day Youth Achievement Camp (including Parents’ Talk) at www.rp.edu.sg/yac. Or if you would just like to attend the Parents’ Talk, sign up at www.rp.edu.sg/parents_talk2015.